ALBERT LEA, Minn. – June 17, 2013 – By simply clicking "like” on Schweigert’s Facebook page, meat fans are entered into the “Overly Uncomplicated” sweepstakes. The 1st place winner will receive a Weber gas grill custom imprinted with the “Overly Uncomplicated” logo. Fifty 2nd place winners will receive a prize package that includes a grilling condiment set housed in a miniature imitation charcoal grill, as well as a grilling apron and a can cooler. Two hundred 3rd place winners will receive a grilling apron and can cooler. One thousand people will receive a custom sausage scented air freshener. As the brand’s tagline implies, Schweigert doesn’t have lavish ad campaigns or make fanciful claims. Here is Schweigert’s philosophy: they make the meat, you enjoy the meat. Everyone is happy. 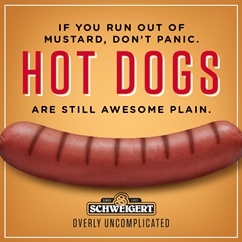 This summer, consumers will also find Schweigert “Overly Uncomplicated” store displays, hear radio advertising and see digital ads on Facebook and Food Network’s Grilling Central Internet website. Coupons for any Schweigert product will appear in Sunday newspapers as freestanding inserts in June, August and October, in markets where Schweigert products are sold. Products include classic natural casing wieners, smoked brats and links as well as the Original Twins Dog and the Twins Big Dog, the official hot dogs of the Minnesota Twins.